Salvia divinorum is native to the Sierra Mazateca of Oaxaca, Mexico. Salvia divinorum is of interest as a hallucinogenic plant, containing psychoactive chemical salvinorin. When the leaves are smoked or chewed for prolonged periods, intense hallucinations occur, explaining the plant's moniker as the diviner's sage. Unlike marijuana, Salvia divinorum does not have leaves or buds that characterize it easily from other plants you may find in the wild. Knowing a few of the characteristics may help identify it in the wild. Observe the leaf coordination on the plant. David J. Robson of the University of Illinois says the leaves appear on opposite sides of the stem from each other, which differentiates it from many other salvia species. Look for white blossoms that have medium-purple calyx between the white tubes. Crush the leaves between your hands and smell it. It should have a light, grassy fragrance. Inspect the stem for a square shape. Observe the height. Salvia divinorum grows about 3 feet tall with a leaf spread of 2 feet, which is larger than other salvia plants. Check the leaves for an oval shape, with light green veins along the surface. Some leaves become very large, almost the size of a hand. Blue Salvia (also known as Mealy-Cup Sage) has a wonderfully long blooming period and looks absolutely incredible planted in mass or in containers. An excellent cut or dried flower, Victoria Blue Salvia has particularly deep purple/blue flowers and is a dwarf, attaining a height of only 18 inches. Does well in hot, humid climates. Drought tolerant - grows on dry hillsides in it's native Texas and New Mexico. 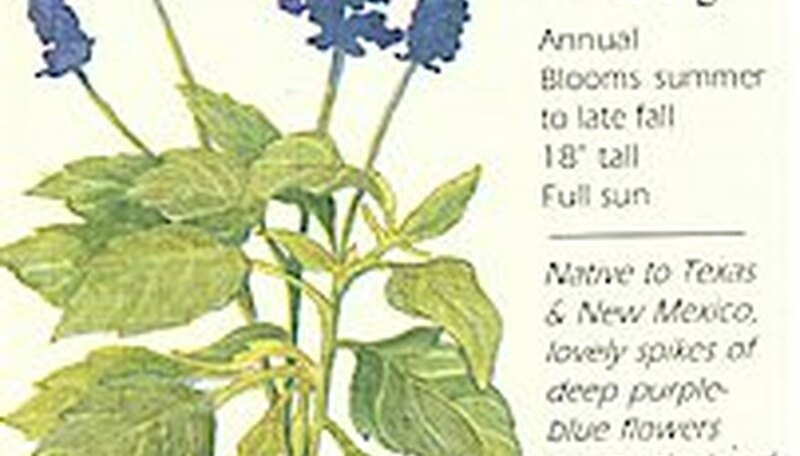 When to Sow Outside: Sow directly outside only in USDA zones 8 - 10 where Blue Salvia is a perennial, 2 weeks after last frost. Start indoors in colder zones, where it is grown as an annual. When to Sow Inside: 12 weeks before last frost. Rake the soil around the salvia plants to remove any old mulch, fallen leaves and other debris. Sprinkle a water-soluble 10-30-10 fertilizer on the soil between the salvia plants. Apply the fertilizer at the rate suggested on the fertilizer package. Lightly scratch the fertilizer into the top 1/2 inch of soil with a gardening fork. Water the plants until the top 3 inches of soil is moist. Apply a fresh 3-inch layer of mulch around the base of the May Night salvia, spreading it in a 1-foot radius around the plant. Deadhead the spent blooms of any perennials as they occur. This will allow the plant to flower again and keep it from self-seeding. Deadhead salvia in the late spring and asters in the fall. Cut back the spent flower stalk to just above leaves. Cut back salvia and other spring blooming perennials by half in the early summer. Cut back asters and any stalky fall blooming perennials by half in the early summer. They will have time to regrow for flowering in the fall. Remove any dead, damaged or diseased foliage from flowering plants as they occur. Cut back asters, salvia and other flowering perennials to the ground after their foliage dies back in the late fall. Salvia has been around for centuries, originating in central and southwestern Asia. Pliny the Elder first used the Latin name salvia, which means “to save”. There are many different varieties of salvia available, approximately 700 to 900 species. Salvia grows 10 inches to 4 ½ feet high. It requires mostly sunny conditions and even moisture with well-drained soil for optimal growth. Salvia seeds can be sown directly into the garden in early spring or started indoors six to eight weeks after the final frost. Seedlings should be spaced 10 to 20 inches apart. Spent blooms should be pinched off to promote continuous flowering. Salvia is best used in beds, containers or as fresh or dried cut flowers. Salvia is classified as both an herb and a flower. Fill seed starter trays with potting soil. Place salvia seeds in the trays, 1 or 2 seeds per cell. Cover with a light layer (1/8 inch) of potting soil. Spray soil with water from a mister or spray bottle until moistened, but not soaking. Water every 2 days or more to keep soil evenly moist. Cover the seed tray with plastic wrap and set in a warm, sunny location. Salvia seeds need temperatures between 65 and 70 degrees F. to germinate, so keep them warm. Remove the plastic film once seedlings emerge from the soil. Plant seedlings when they are 2 to 3 inches tall and all danger of frost is passed. Prepare the soil to plant salvia in February. A sunny spot is best, but if you live in a hot climate, plant salvia where it will get shade during the hottest part of the day. Remove any weeds with a hoe, and work a shovelful of compost into the top of the soil. Use the corner of the hoe to make a shallow trench, and plant the salvia seeds in the trench about 12 to 18 inches apart. The soil should be kept moist initially, so until the salvia seedlings are established, water the soil lightly every day. Once the saliva is a few inches tall, decrease watering to twice a week. Feed salvia every other week using an all-purpose, water-soluble fertilizer. Pinch off spent salvia blooms to encourage the plant to continue blooming throughout the season. Select a salvia plant at the nursery, buying a small plant in a 4-inch pot. Make sure it was cultivated indoors. Fill the bottom 3 inches of the pot with gravel. This will improve drainage and prevent root rot. Fill the rest of the pot with potting soil. Water thoroughly and let sit overnight. Plant the salvia plant by scooping aside dirt to create a hole and then gently placing the plant into the hole, making sure there's enough room for the root ball. Fill the hole with dirt and then pat down on the surface to make sure the plant is secure. Set the pot in a location with partial sunlight, about two or three hours. Salvia plants can handle more sun if they are watered frequently and misted. Fertilize right after planting and then once every other month. Always water immediately after fertilizing; the roots of the salvia absorb nutrients only if they have been dissolved in water. Keep the soil moist, but not soaked, at all times. Mist the plant's leaves with a mister daily, at least until the plant attains a height of 4 feet.